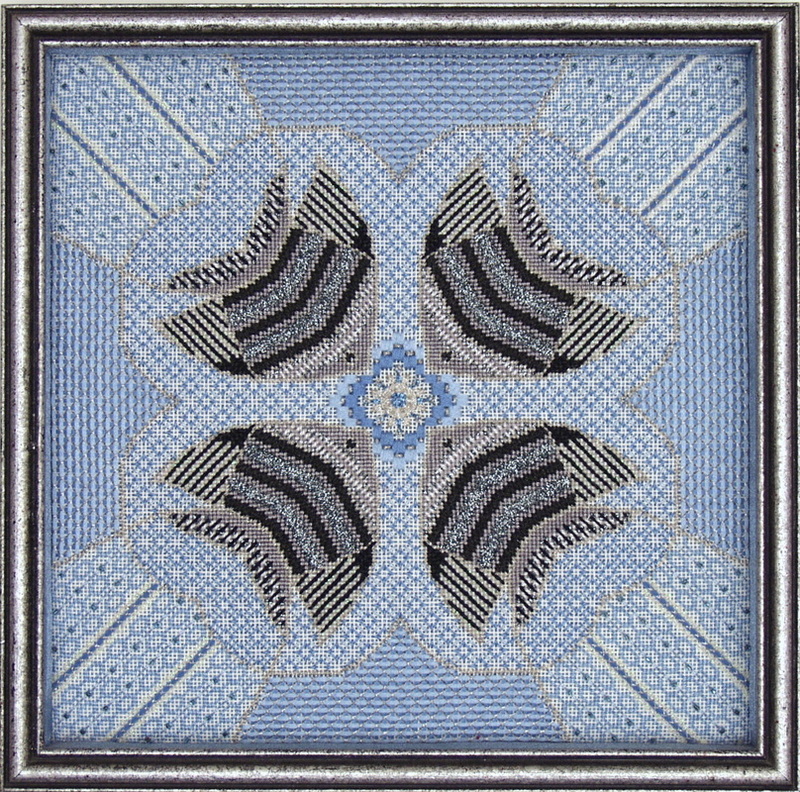 Underwater Ballet is a mixed media canvas design that incorporates a variety of techniques that include unconventional blackwork, couching, bias bargello and open canvas patterning. Converging courses are suggested by the dramatic stripes behind the "synchronized swimmers" as they pause in perfect unison to investigate a mysterious underwater object. Six different metallics are combined with beads and shiny cotton threads (or silks, if preferred) to create a dazzling underwater scene. A simple Tent outline in silver metallic is used to establish the contours of the symmetrical design. Threads for two color combinations are included in the materials list below, but with the wide array of threads available today that fit 18-mesh canvas, any number of imaginative combinations are feasible. NOTE. The supplies listed are used in the bright blue example shown on the frontispiece. Thread substitutions are listed in parentheses for an aqua combination.An alternative version in elegant Trebizond silks combined with Anchor flosses is listed in the instruction booklet along with some suggestions for more fanciful fish. Tapestry needles: #20. #22, #24, #26 and #28.